So how were the holidays? Old news, I know. Rain the dog says hello. 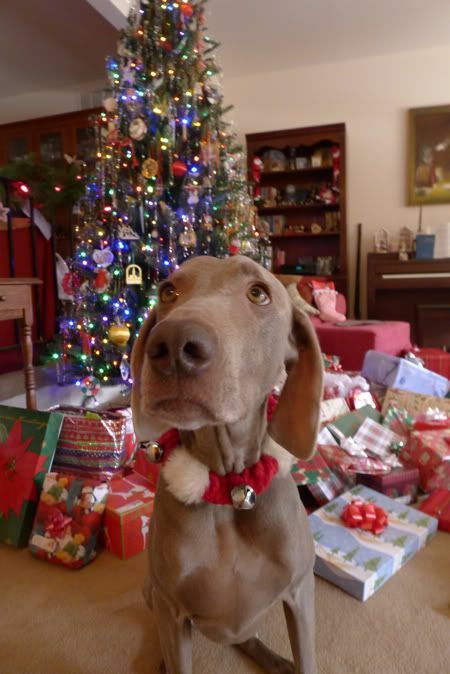 This is my attempt at being William Wegman. 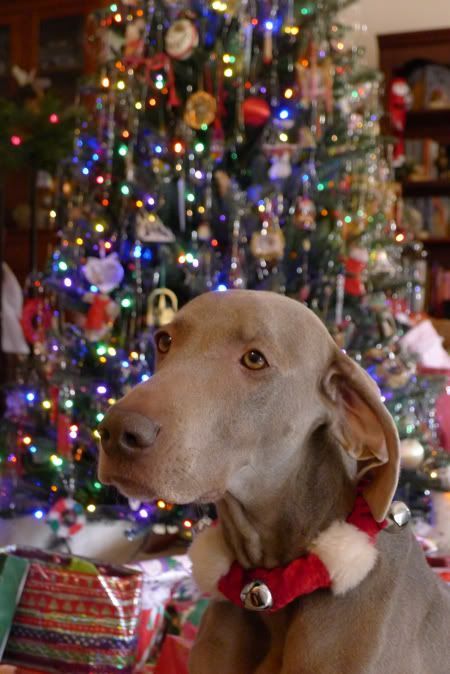 Weimaraners always look horribly depressed in photos. Cheer up, Rain, it's Christmas. Look at all those gifts! Even though our Christmas gift exchange involves much trading of Internet links beforehand which lessens the surprise, it's still so much fun. Here's some of the highlights, so you can feel like you are an honorary member of the Chapin family. 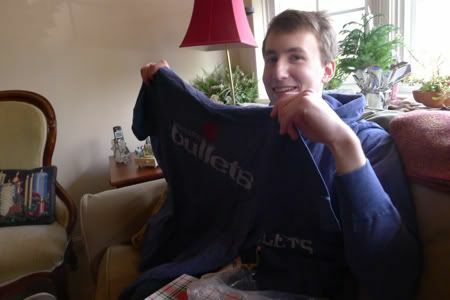 Danny gets both an old-school Bullets sweatshirt and t-shirt, making him a "double hoopster." Rare indeed. 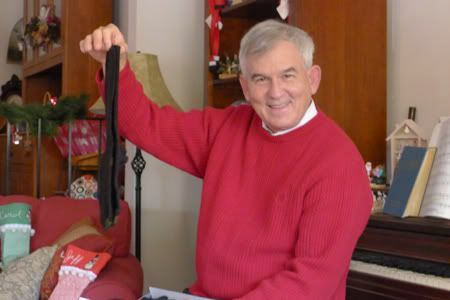 Have you ever seen a man happier to be getting socks as a gift? Unlikely. My dad is the sweetest. He got my mom a new dustbuster, as requested, but he picked out the wrong one, despite much coaching and many Post It notes. My mom was incredulous. "I knew it was the wrong one when I bought it, but I wanted you to have something to open," Dad said. "I just wanted to see your look of disappointment as you passively aggressively crumple the wrapping paper," Danny said. I got her a William Wegman calendar, per usual, so maybe that eased the pain. 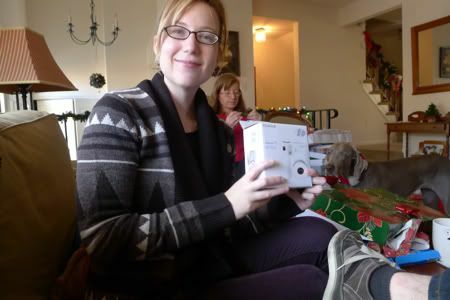 Here's my new Christmas sweater and Fuji Instax MINI camera that prints out photos instantly. More about the camera later. It is so much fun. 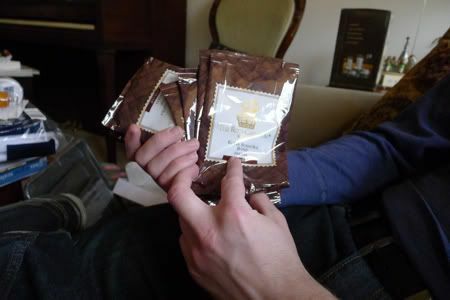 My brother unwraps some coffee that my parents "liberated" from the Ritz Carlton on their Hawaii vacation earlier in the month. My mom loves to get us practical, survivalist presents for Christmas. 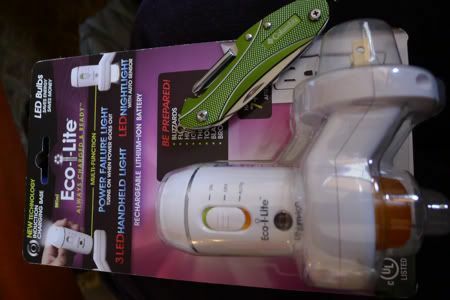 I received a pocket knife and a flashlight that stays plugged into the wall at all times for surprise natural disasters. It's quite a clever idea, actually. Danny opened his flashlight first, and for awhile, I thought mom only cared about his survival. We are prepared for all Mother Nature can throw at us now. Guess what else my parents got me. A re-up for my People Magazine subscription. AWWWW! They know me so well. That about wraps up Christmas 2011. But Rain, look! You got something too! January 3, 2012 by Adele Chapin.